During their meeting on 16 October 2017 in Paris, the Advisory Body and the Consortium of the BBMBC project “Blue Biotechnology Master for a Blue Career”, which the Atlantic Arc Commission is involved in, prepared an initial promising assessment of the “Applied Blue Biotechnology” Master’s Degree programme and are already discussing preparations for the next academic year. 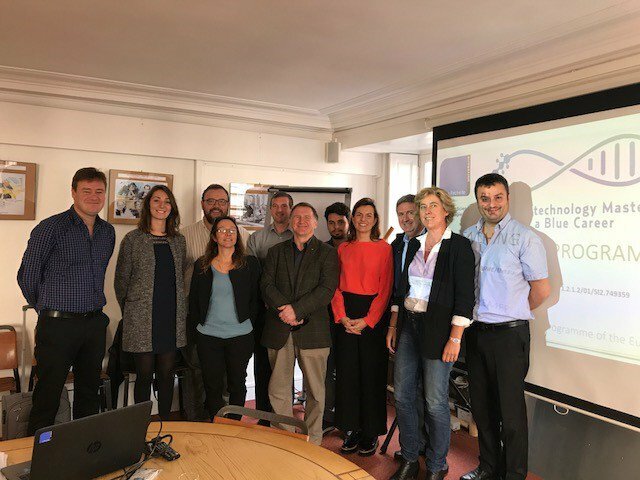 The BBMBC project’s Advisory Body, made up of representatives from the Region of Nouvelle Aquitaine, Basque Country University, and the Regional Association of Biotechnology Companies in Valencia, met in Region Nouvelle Aquitaine’s offices in Paris on 16 October 2017, together with the Consortium members: University of La Rochelle, Valencia, Stirling, Scottish SME Xanthella and the CPMR Atlantic Arc Commission. During this meeting, the members drew up an initial evaluation of the project aiming to create a professional Master’s Degree in blue biotechnology applied to health, nutrition and aquaculture. The first students entered the Master’s programme on 6 September 2017 at the University of La Rochelle, project leader. The courses, taught in English, are already preparing students for their research project. An ambition for professional integration rests on this scientific training. From the first semester onwards, the Master offers students the opportunity to benefit from a period of immersion in a company. It is also planning to organise a summer school on 25 and 26 June 2018, during which students will have the opportunity to present their research work to a large audience. In light of these encouraging results, the discussions at the meeting on 16 October also focused on the future of the Master’s Degree programme. The Atlantic Arc Commission, in charge of communication, is currently preparing for the next academic year. During the Innovation Working Group meeting, to be held on 14 December 2017, it will address the issue of the Master’s visibility to universities located in its Member Regions. The meeting also provided an opportunity to discuss the future of the Master’s Degree programme after the end of the project, which is scheduled for December 2018. These discussions will continue in December 2017 at the next meeting with the Members of the Advisory Body and the Consortium.